You can read the match reports on all of today's games by heading to the BBC Football scores and fixtures page. There's also a preview on tomorrow's match between Chelsea and Manchester United as they battle it out for the final quarter-final spot. That game is live on BBC One from 19:00 GMT or you can follow Radio 5 live with text commentary online. The draw follows it. These are the ball numbers again. That's my work done in the FA Cup fifth round. Thanks for following! Here's the highlights from all of today's matches. "It’s good that we are there, I am very proud of that. Today we owe an amazing debt to our fans, I don’t quite know how they got there with the problems with the trains, and I thought we were playing at home for large periods of the game. "That’s not easy, to quieten a crowd like Doncaster’s in a game like this. We owe them a great debt of gratitude and we hope we can reward them by winning our quarter-final and hopefully getting a home tie." Brentford manager Thomas Frank speaking to Match of the Day: "We were outplaying them in the first half. We were by far the better side. They only created four, five chances - and we lost 4-1. "I can’t blame the boys too much. I think we made some individual mistakes that were punished unbelievably for the goals. "We tried to regroup at 2-1. Maybe we could have stayed in the game and turned it around, but Swansea were too strong." On Ezri Konsa's red card: "I think it was pretty obvious." My favourite moment of the day? I got way too excited. 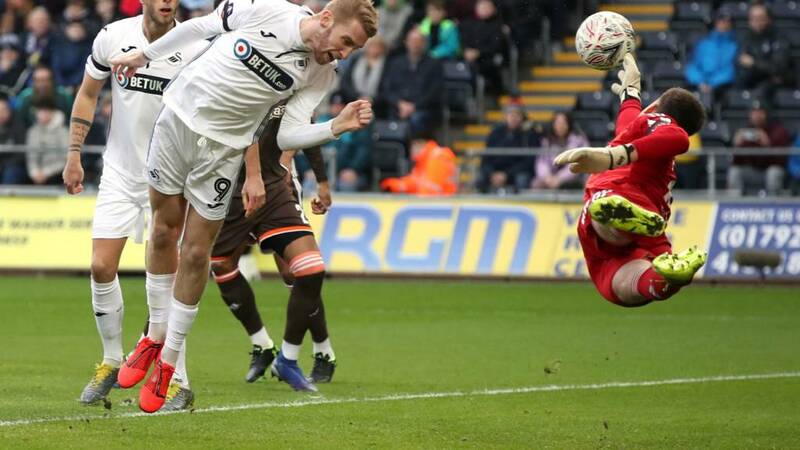 Swansea manager Graham Potter speaking to Match of the Day: "I thought Brentford were the better team in the first half. We had to respond at half-time because the environment was not so positive. "We needed to change the dynamic. We had to respect that we were playing against a good team. We were probably happy to be 1-0 down at half-time and still alive in the game. "Daniel James’ performance was fantastic. The collective quality in the second half was very good, but his performance was one to be very, very proud of. "It's a fantastic cup competition. [Reaching the quarter-finals] doesn’t happen too often in Swansea’s history, so we’re looking forward to the draw." "He’s been fantastic this season, especially these last games. It was another important goal, his fifth and that’s not bad coming from midfield, playing in a position where he has to do a lot of defending. "It was a cracking goal, to run from two yards in your own half, hold the ball that long, hold off challenges then strike it as well as he did was a great start for us." On penalty shouts: "The first one was one of those I always say is too harsh to give. I think he was sliding and not trying to get his hand to the ball. The second there was maybe a bit more intent, on the law of averages we could have got one of them. "I don’t think it mattered, it wouldn’t have made us any more comfortable in the second half and I am quite pleased to see referees occasionally give defenders the benefit of the doubt when it’s obviously not a case of deliberately handling the ball." Fan Mardey: Good effort rovers but in the end quality came through and palace put in a very professional performance. Which miss was worse? Brentford's Neil Maupay's today or QPR's Toni Leistner on Friday night? Crystal Palace manager Roy Hodgson speaking to BBC: "We need that attitude because we played a very good team, I thought they played very well. "The pitch was a little bit hard and bumpy, so it wasn’t easy to get the ball down and pass it like we like to do. "I thought they did a fantastic job and I think they will be very proud of their performance, as I think it was an even game for long periods but luckily we got two good goals. "We’ve got to be happy, these games are real banana skins because people don’t give Doncaster Rovers and these kind of teams the credit they should. We did, I said they would be tough and we were ready for it." "We played the game reall well, it was a good game but we saw the difference with a Premier League team. I thought between the boxes we were good, but in the final third we didn’t get enough shots away. "I thought we matched them for large periods, but you give players of that standard those chances it will be hard. The goal before the break took the wind out of our sails a bit. "We like to get about teams, that’s how we approach it, but we were not going to leave anything in the changing room and we gave it a go today." Here's two of the best goals from those games. Crystal Palace's Jeffrey Schlupp speaking to BBC: "It was tough, we’d seen their form and we knew it was going to be tough. But we are pleased to have won, and we scored two good goals. "We knew if we got past this we’d be in a good position to get to Wembley. It’s a great tournament but if we get a lesser team, so to speak, we have a great chance." Just a reminder that the draw for the FA Cup quarter-finals will take place live on BBC One following Monday's fifth-round tie between Chelsea and Manchester United. Swansea goalscorer Daniel James on BBC One Wales: "At half-time we were a bit frustrated. The gaffer said don't let them stop us playing and be brave and get on the ball. On his solo goal: "I just went to block a shot and it came back to me - I saw 50 yards of space and kicked it on. "Second half we played Swansea football. It's amazing to be in the quarters. Whoever we get we have to be ready to beat them." Credit to Doncaster, they gave it a good go in the second half but they have bigger fish to fry. Very professional from Palace, Doncaster huffed and puffed but Palace were always in cruise control. "The trophy is in sight". Palace dominated throughout, controlled it and it was a really impressive performance away from home in what could have been a hostile environment.